This recipe hearkens back to a cookbook that I used to use quite a bit when I still ate meat, called Betty Crocker’s Good and Easy Cookbook. I was reminded of it recently when I made Happy Herbivore’s lemon dill potato salad, since one of the things I used to make from it was lemon dill chicken. Thinking back on it, I realized that the flavors would probably taste pretty good with tofu (and I am planning to try that sometime). I also remembered a marinated beef recipe that was one of the few ways I would actually eat beef in the days before giving up meat entirely. It was called “Korean Barbecued Beef,” which is sort of odd since no actual barbecuing was involved. Instead, the beef was marinated in a sweet soy sauce mixture and subsequently stir-fried. The flavor of the marinade was extremely good, so I thought…why not do something similar with seitan? The result wasn’t much like what I remembered, but it came out good nonetheless. 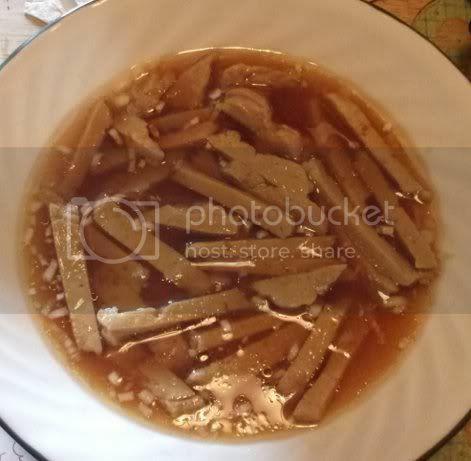 I took the original marinade, which was basically a mix of too much soy sauce and way too much sugar, added some vegetable broth, and switched out the regular oil for sesame oil. 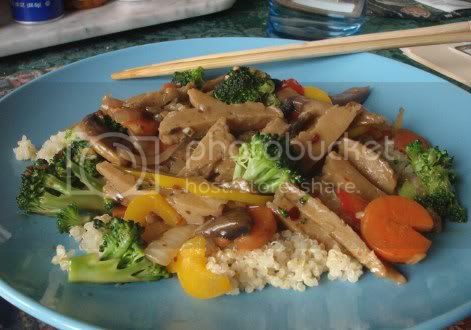 Then I took a cue from my favorite stir-fry recipe in The Clueless Vegetarian and used a little arrowroot to turn it into a stir fry sauce, added at the end of cooking time. And of course, what’s a stir fry without a tasty array of veggies? I served this over plain old quinoa, but it would also be good with red quinoa, any fragrant white rice, brown rice, or your favorite noodles. 1) Combine all the marinade ingredients in a shallow bowl. 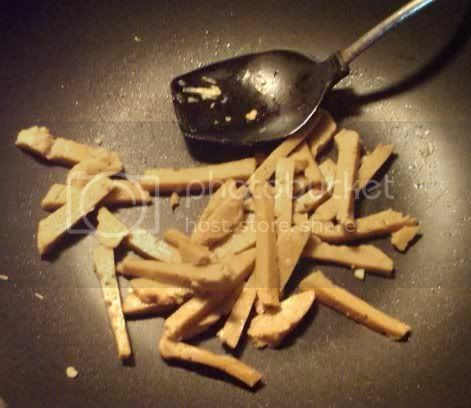 Add the sliced seitan and marinate for at least half a hour, turning occasionally. 2) Heat a sautee pan over medium-high heat. Transfer the seitan to the pan, reserving the marinade. 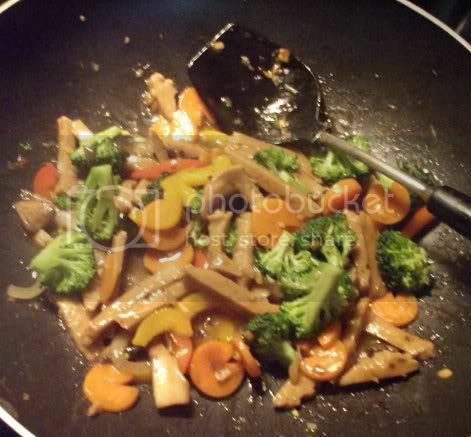 Stir-fry until browned on all sides, 5-7 minutes. Remove and set aside. 3) Heat the vegetable oil in the same pan over medium-high heat. Add the ginger and hot pepper flakes and stir fry until fragrant, about 30 seconds. Add the onion and stir fry for a couple of minutes until soft. Add the bell peppers and carrots and cook until they begin to soften. 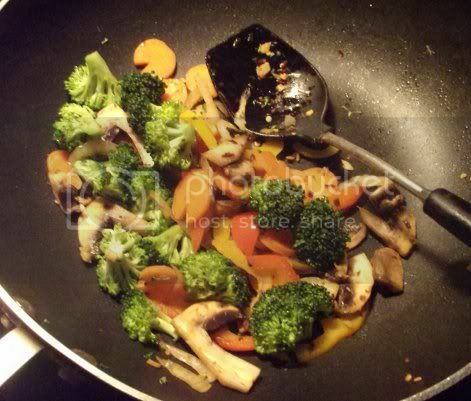 Add the broccoli and stir-fry until bright green, then add the mushrooms and cook until just softened. 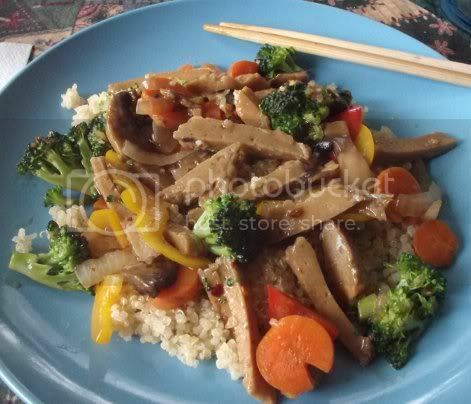 4) Return the seitan to the pan and stir-fry for another minute or so. 5) Add the cornstarch to the reserved marinade and mix well. Pour over the contents of the pan and cook until thickened and glossy, 1-2 minutes. Serve over rice or quinoa, garnished with green onions.